Most people think of arthritis as a type of joint damage that happens with old age. However, not all forms of arthritis are limited to the joints. Rheumatoid arthritis is a form of arthritis that happens due to inflammation, and it can affect people of all ages. This chronic inflammatory condition can be very uncomfortable and unpleasant, but new treatments make it possible to manage the condition and still live an enjoyable life. Though medical treatments are very useful, you can make several lifestyle changes that can help to reduce pain and prevent joint damage. Some people find that with changes to lifestyle, they may be able to manage symptoms without the need for medication. These measures are simple, and you may find provide measurable relief to aches and pains. Though it might be slightly uncomfortable to exercise, studies have found that regular exercise helps to reduce pain by strengthening the muscles around the joints. Gentle exercise that does not put pressure on joints, such as slow walks or swimming are normally the best option. Any sort of anxiety, depression, or stress tends to raise levels of the stress hormone cortisol, which increases inflammation, so it can also be helpful to practice meditation and other stress management techniques. There is no specific diet that every patient with rheumatoid arthritis should follow, so a diet for arthritis normally just focuses on adding beneficial food items and reducing food items that cause inflammation. lower intake of foods that contain omega 6 fatty acids, such as corn and soybean oils. People with rheumatoid arthritis also need higher levels of folic acid, vitamin C, B vitamins, calcium, magnesium, vitamin D, zinc, and selenium. If lifestyle changes alone are not enough to manage arthritis – it is important to start treating it as soon as possible so that the condition does not worsen rapidly. The most common treatment for rheumatoid arthritis is corticosteroids such as prednisone. Though these steroids halt inflammation, they may have unpleasant side effects, including skin thinning, weakened bones, and weight gain. Disease modifying antirheumatic drugs (DMARDs) are another type of treatment for rheumatoid arthritis that helps to preserve joints and prevent serious damage. These DMARDS are particularly effective when paired with biologic response modifiers, such as abatacept, anakinra, etanercept, and golimumab, that help to reduce immune system responses. Pain killers are also recommended for rheumatoid arthritis patients. Though they may not halt joint damage, they at least help to provide some pain relief. If medications do not prove effective at halting joint damage, surgery may be needed to preserve joint mobility and function. Since the immune system mostly attacks the synovium, a synovectomy to remove the inflamed membrane can reduce inflammation around the joint. If a joint no longer functions due to weakened tendons, tendon repair surgery can help to restore function. Joint fusion surgery is also an option for unstable joints that cannot bear weight. Though a joint fusion will limit the range of motion, it helps to reduce pain and keep joints from popping out of place. For very important and extremely damaged joints, a prosthetic joint replacement can help a patient to regain movement. Rheumatoid arthritis is a unique form of arthritis that happens when the immune system malfunctions. Normally, the immune system only attacks harmful microbes that enter the body, but in rare cases, it can become overactive and start attacking perfectly healthy tissue in the body. If the immune system starts attacking the membrane linings around the joints, which are called synovium, then inflammation occurs. This inflammation starts to damage the cartilage, tendons, ligaments, and bones in joints. Over time, joints can start to swell and become almost unusable. So far, the precise reason that the immune system starts attacking joint is not fully understood. However, medical research has shown that there seems to be a genetic component, and people who have a genetic predisposition towards rheumatoid arthritis may develop it after environmental toxins or other health problems trigger it. You are more likely to get this condition if you are over the age of 40, smoke, are female, or are obese. 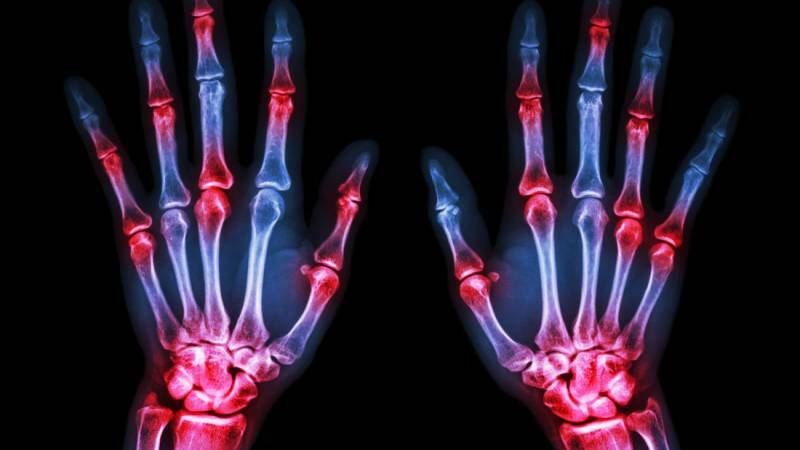 Inflamed joints – The first sign of rheumatoid arthritis is often swollen and reddened joints that feel warm and are tender to touch, and this is caused by inflammation attacking the joints. Normally, the small joints of the feet and hands are the first to be affected, and as the condition worsens, the inflammation starts to affect the joints of the arms, legs, hips, and shoulders. Stiff joints – People with rheumatoid arthritis may have difficulty moving or bending their joints. Normally, this stiffness is worse after waking up or staying still for a while, and it goes away gradually throughout the day. If the stiffness is extreme, joints may become locked into place. Slowly healing injuries – People who have rheumatoid arthritis may find that it takes their joints an extremely long time to heal after they sprain, strain, or otherwise injure an area. Rheumatoid arthritis tends to weaken joints, making it more likely for patients to suffer from injuries. Joint pain – All of the inflammation in joints can create quite a lot of discomfort. The pain caused by rheumatoid arthritis tends to be a strong, throbbing ache that occurs in both sets of joints simultaneously. This means that a person is likely to suffer from pain in both hands, both feet, or both knees at the same time. Carpal tunnel syndrome – All of the swelling in the joints of the arm can compress a person’s nerves. This causes them to develop carpal tunnel and experience pain, numbness, or tingling in their arms and hands. Other damaged body areas – The inflammation of rheumatoid arthritis does not just damage joints. Some people may end up dealing with damaged kidneys, eyes, lungs, heart, or salivary glands due to rheumatoid arthritis.